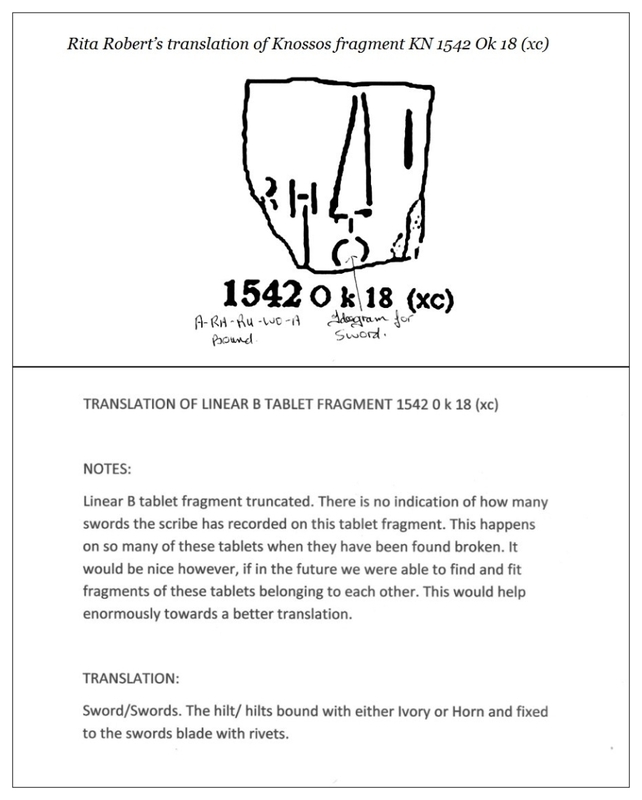 It is common knowledge in the Linear B linguistic research community that there are a great many series of Linear B tablets which share marked formulaic textual characteristics. Among these we find the Linear B “pakana” or – sword – series of tablets and fragments, amounting to some 15, from KN 1540 O k 01 to KN 1556 O k 11. I have assigned my research colleague, Rita Roberts, who is at the mid-term mark of her first year of university studies into Mycenaean Linear B, the challenging task of translating all 14 or 15 of these tablets and fragments (most of them fragments), in an effort to extrapolate from her translations findings which can and do confirm and validate the hypothesis that the tablets and fragments in this series are almost all variations on a “standard”, hence formulaic, text. This is the first of several posts in which we shall be analyzing the results of Rita’s findings. Once we have posted all of our co-operative findings, Rita and I shall be co-authoring an article on the formulaic nature of the tablets and fragments in this series in particular on academia.edu, the results of which can be extrapolated to any number of series of tablets and fragments of Linear B tablets from Knossos (and some from Pylos as well), regardless of the sector of the Minoan-Mycenaean economy on which they focus, the most notable being the sheep husbandry sub-sector of the agricultural sector, for which there are almost 700 (!) extant tablets, or some 10 times more than in any other sector of the Minoan-Mycenaean economy, inclusive of this one, the military. In the meanwhile, we are focusing our attention on this series of tablets in particular. Mrs. Robert’s translation of this tablet is, as usual, precise, technically sound and elegant. It all comes to one observation and one only. The texts of all of the tablets I have mentioned above, however fragmentary, are merely minor variations of one another, in other words, they are all formulaic. 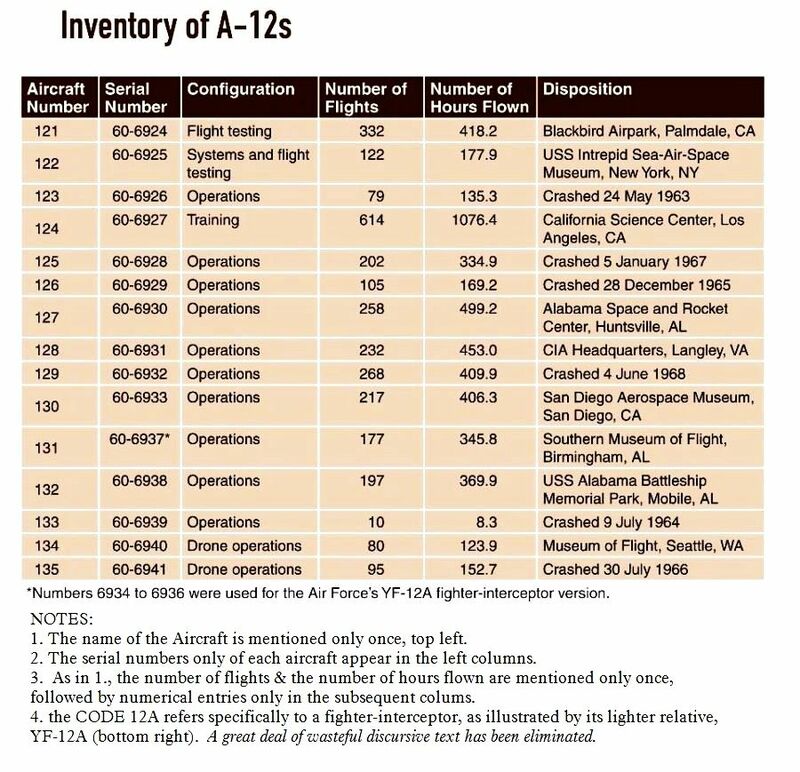 The text of any one of them is close to a mirror image of any of the others, usually with only one or two attributes and the number of tablets inventoried in each at variance. That is the single factor we need to focus on above all else, though not exclusively to the exclusion of others. A skilled horn worker has bound the hilt with horn and fixed it to the sword’s blade with rivets. Sound familiar? You may very well protest, “Aren’t you jumping to conclusions?” and you might have been right, were it not for the fact that, as we soon shall see in subsequent posts detailing the contents of several other tablets and fragments in the same series, snippets of the very same text, more or less intact, keep popping up. And among these, two tablets — the first of which we have already seen as the first figure in this post — spell out the text entire (less one or two words, if any). So it stands to reason that if, in so far as the missing text of this tiny fragment almost certainly is the same as that of the other tablets, with minor variations in wording and in the number of swords tallied, this little scrap of text is a mathematical subset of the text we have already encountered in the first of the tablets posted in this series (KN 1541 OK 09 (xc)), then other, more complete, snippets of the same text appearing on other tablets we are soon to investigate simply confirm and validate our assumption, corroborated by the cumulative evidence brought to bear by the partial or complete text of those other tablets in this series. we discover, scarcely to our surprise at this point, that the text of KN 1543 OK 17, though not as complete as that of the first tablet posted here (KN 1541 OK 09 (xc)), is practically a mirror image of the former. The formulaic nature of the text of almost all of the tablets in this series ( KN 1540 O k 01 to KN 1556 O k 11), with few exceptions, is as we say nowadays, “in your face”. 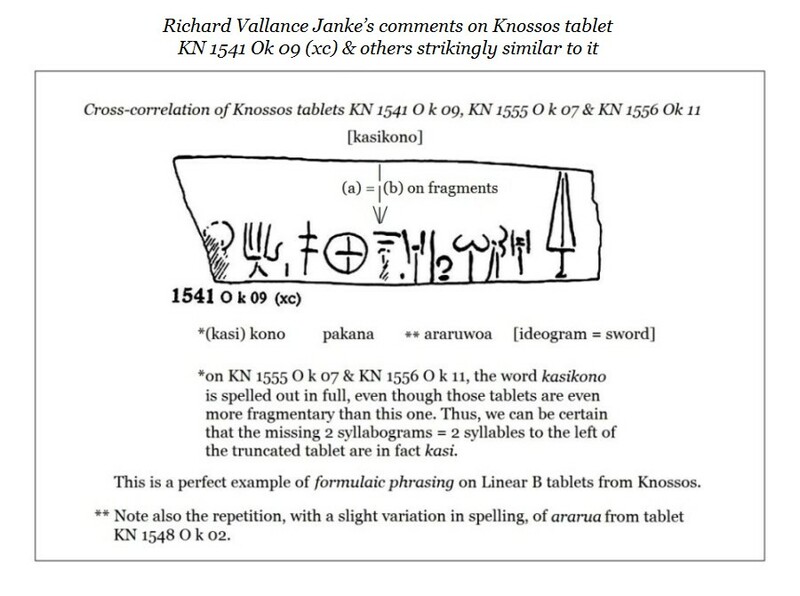 This simple fact based on strict observation of the variations on the recurrent text to be found on almost all of these tablets firmly confirms the hypothesis that in fact formulaic phrasing is a prime characteristic of all of the tablets in this series, and for that matter, in any number of series of tablets in Linear B from Knossos, regardless of economic sector. It is the tablets in the sheep husbandry sector, of which there around 700 (far more than in any other sector), which confirm and concretize this conclusion over and over. which I have just reblogged below for your convenience. It is highly advisable for you to read this post in toto, as it sheds significant light on the present discussion. It is in fact this very tablet upon which we are to draw our ultimate conclusions with reference to the translations of this entire series of tablets. In our final post in this serial discussion, we shall actually  cite the text of this previous post in its entirety, with additional glosses reflecting any further conclusions we may have drawn once all of the tablets in this series have been posted. As is usual with Mrs. Roberts, she once again finesses another translation of the many military-related tablets in the Knossos armoury. She has chosen military affairs as her primary area of interest in her first year of university studies. She certainly has her hands full, as there are scores of tablets from Knossos focusing on this sector of the Minoan-Mycenaean economy. (b) Only the totals for the number of swords on each one of the tablets running in a straight series vary. The text does not. It is fossilized, i.e. formulaic to the extreme. 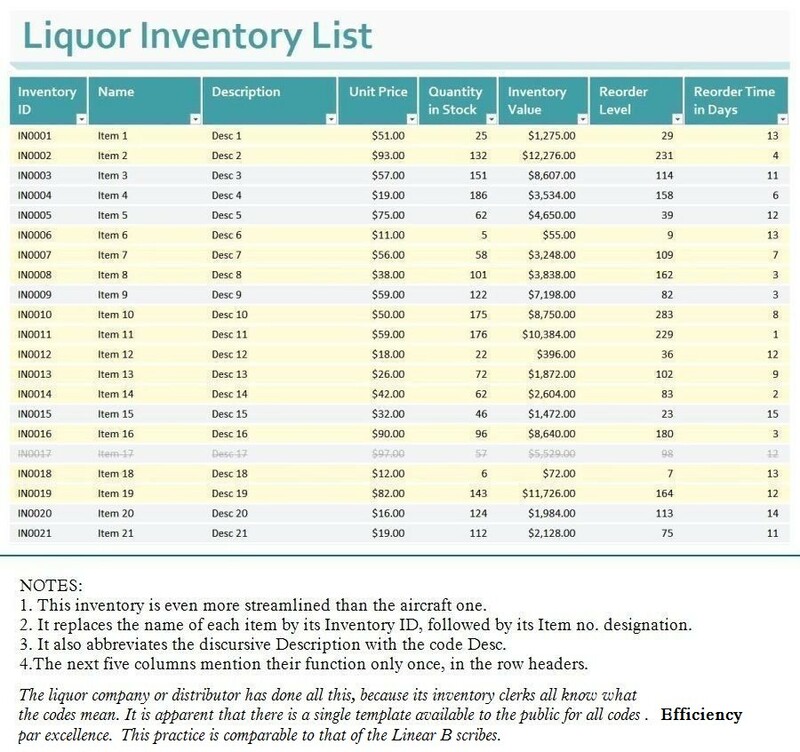 (e) This finding can hardly be surprising to us or anyone who stops to think about it, given that inventories, ancient and modern, are always standardized and always formulaic. 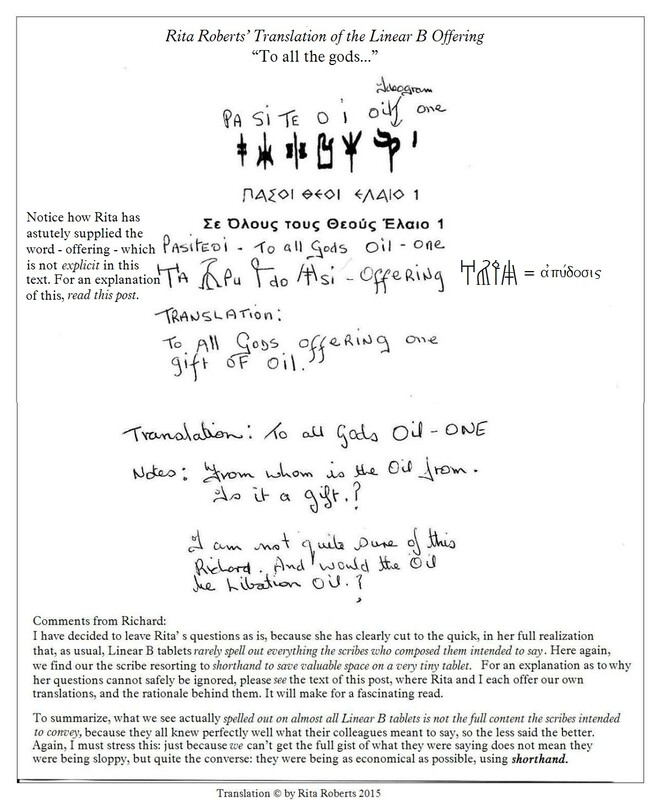 As we document each of Rita's translations of the tablets in this series, we shall soon enough realize that the formulaic standards imposed by the scribal guilds are universal, once again regardless of economic sector or provenance. 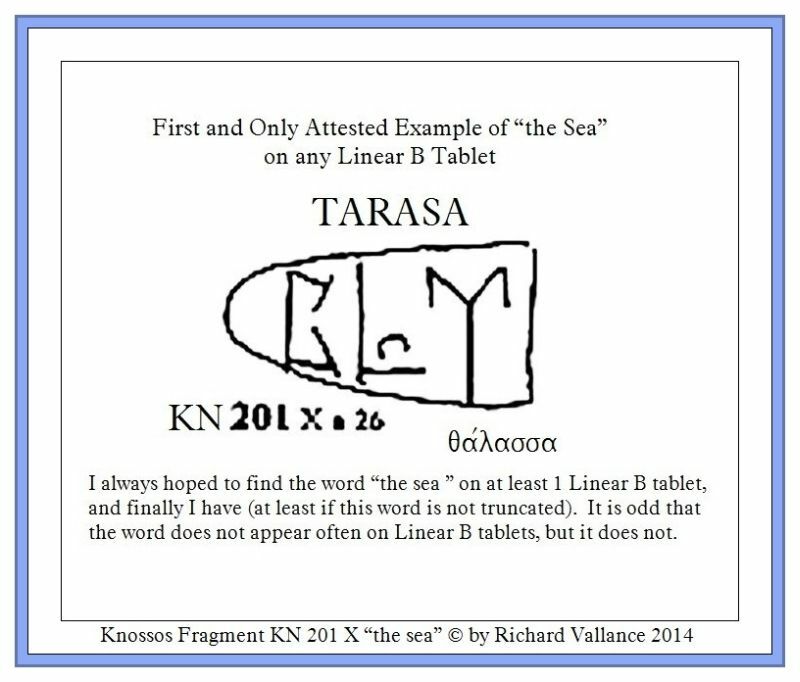 This is one of the most salient key characteristics of tablets in Linear B, and I strongly suspect of the tablets in Minoan Linear A before them... which leads me to my next observation, namely, that the formulaic practice also likely underlying all such tablets in Minoan Linear A as well may be a crack, however small, in the doorway opening up to at least a partial decipherment of the Minoan language. 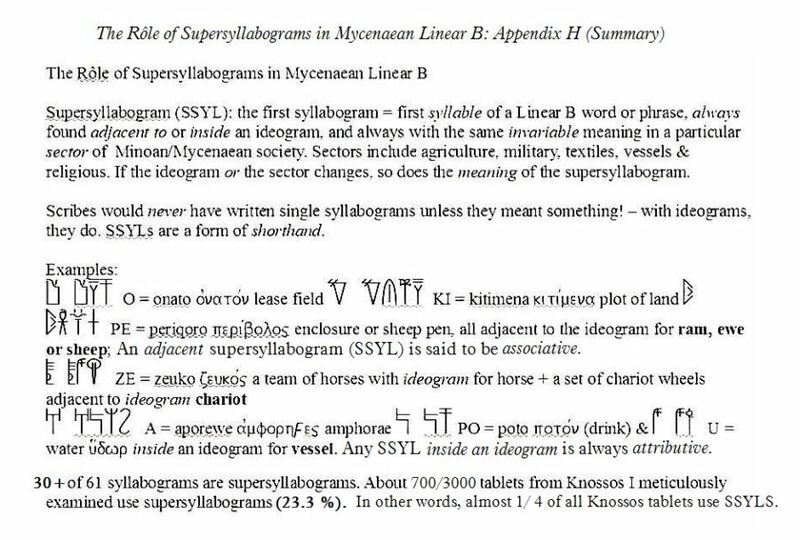 All About Sypersyllabograms: Their Enormous Impact on the Nature of Linear B – Everything you ever wanted to know, but were afraid to ask! Given that supersyllabograms invariably display the characteristics highlighted in the previous post, they must also be formulaic by nature. The several restrictions placed on their disposition next to or inside ideograms, the invariability of their meanings within each sector, and other such considerations means they are always formulaic. 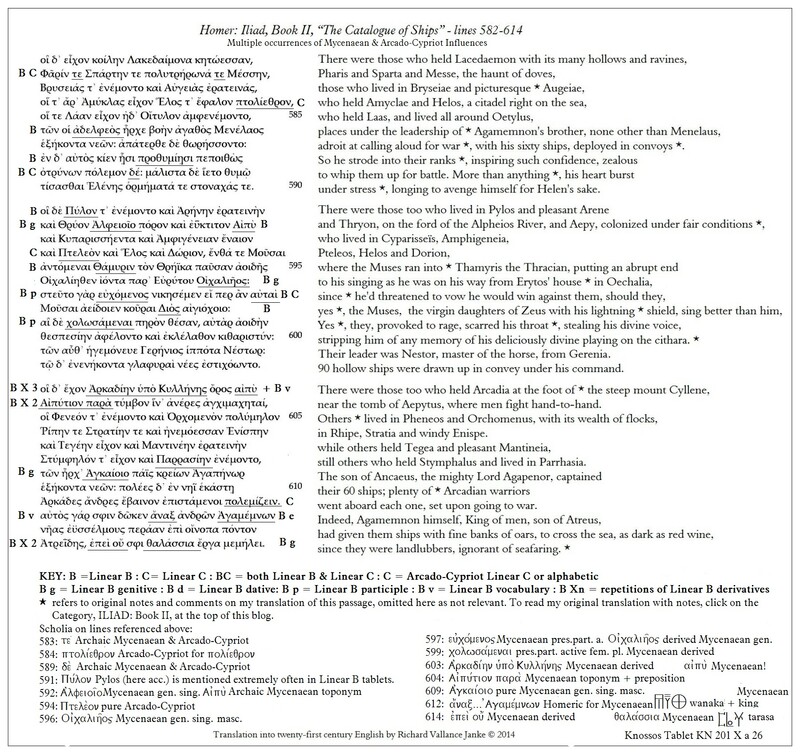 Although the language of Homer is also very often formulaic in the Iliad, especially in The Catalogue of Ships in Book II, there is probably little or no relationship between the formulaic nature of supersyllabograms in Mycenaean Linear B and his archaic formulae. Nevertheless, it cannot be denied that formulaic language is a particular characteristic of both Mycenaean Linear B and of Homer’s own so-called Epic Greek. However, the nature of the formulaic language of Linear B and that of Homeric Greek are of a different order. While the meanings of some supersyllabograms are firmly established, due primarily to their high frequency on Linear B tablets from Knossos, others are less firmly demonstrable. For instance, in the sector, agriculture, sub-sector sheep husbandry, the meanings of the supersyllabograms O = lease field, KI = plot of land , NE = new & PE = enclosure or sheep pen, are firmly established with a very high degree of probability, if not total accuracy. In the case of PE, the definition is 100 % confirmed, since on one of the tablets in that series, the scribe conveniently spelled out the word in full, instead of using the simple superyllabogram PE. 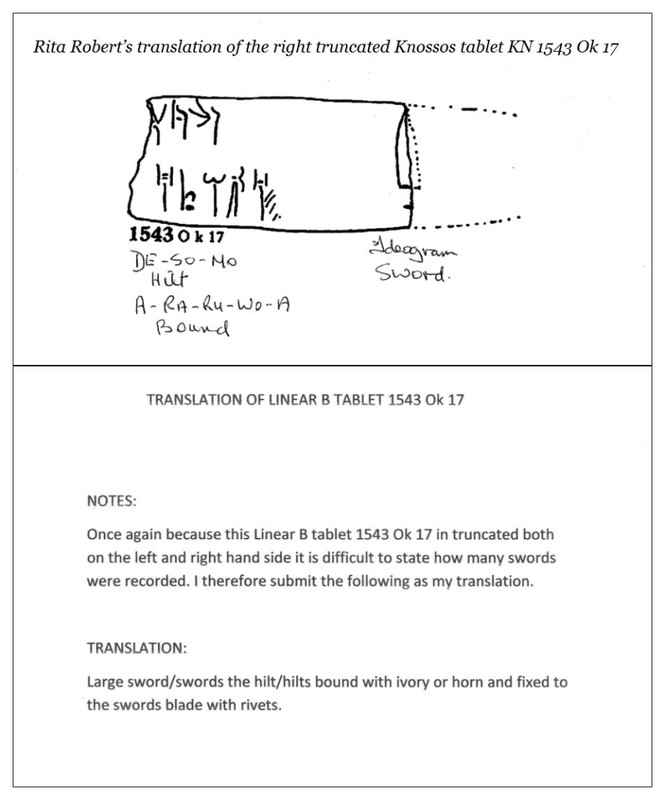 It is this very tablet which establishes beyond a doubt the authenticity of supersyllabograms as a phenomenon innate to Linear B alone, and not found in Arcado-Cypriot Linear C. As for Minoan Linear A, no-one knows whether SSYLS exist, because the language remains recalcitrant to decipherment. In the military sector, the supersyllabogram ZE almost certainly means “a pair of..” or “a team of...”, with a 90 % or greater probability. However, once we get past the two primary sectors in which supersyllabograms are used extremely frequently, given that there are so many tablets to be found in these two primary sectors of Minoan/Mycenaean society, the situation devolves by degrees into less certainty. Supersyllabograms found adjacent to any ideogram, as for instance those with the ideograms for sheep, ram, ewe (livestock), or horse or chariot (military) are considered to be associative. Associative Supersyllabograms are those which define characteristics of the environment or specific context in which their associative ideograms appear. For instance, it is natural and logical to associate sheep with lease fields, plots of land & sheep enclosures. The same goes for military ideograms. The ideograms for horse and chariot naturally associate with pairs or teams of... (fill in the blanks). There are still quite a large number of tablets in the textiles sector; so the meanings of most of the supersyllabograms in that sector are more than likely still very reliable, not the least because each of them still makes good sense: KU = gold cloth, PA = dyed cloth, PU = purple or Phoenician cloth (amounting to pretty much the same thing, anyway) & RI = linen. I would assign at least a 70 % to 90 % degree of probability to each of the definitions I have deduced for each of these supersyllabograms in textiles. The supersyllabograms in the sector of vessels (amphorae, drinking cups, water jugs etc.) may be a little less firm, but I am still convinced that I deduced most of them accurately, yielding a probability of 70 % - 80 %. On the other hand, I have been quite unable to decipher at least one supersyllabogram, SE, which sadly appears only 3 times on extant tablets from Knossos. For this reason alone, I dare not assign it a meaning, since I am quite sure that if I did, I would probably be (way) off the mark. There can be no question whatsoever that these are in fact supersyllabograms, the very first ever to have been isolated, for which we owe Prof. Palaima full credit. Of course, he did not define them as supersyllabograms, as he was unaware of the high frequency of the rest of them as adduced above in this post. Nevertheless, they are what they are, supersyllabograms. We have KO for Konoso (Knossos), MU for Mukene (Mycenae), ZA for Zakros etc. And if a few of you are still in doubt as to the viability of supersyllabograms in Mycenaean Linear B, remember: the very same phenomenon applies to internationally standardized signs nowadays. Once again, nowadays, we have a symbol within a symbol, or if you like, a symbol inside an ideogram. It is truly amazing how such a practice has resurfaced after at least 32 centuries, even if it was only the Minoan/Mycenaean scribes in the ancient world who figured out the system in the first place, leaving it interred for 32 centuries before it re-appeared in the twentieth century. So once again, we find ourselves face to face with a very ancient script, namely the Linear B syllabary, which was so systematic, formulaic and logical that it can only be considered as a brilliant breakthrough in the art of writing. After all, supersyllabograms are not the only phenomenon Linear B sported with such bravado. Ideograms in and of themselves abounded (over 100 of them!). 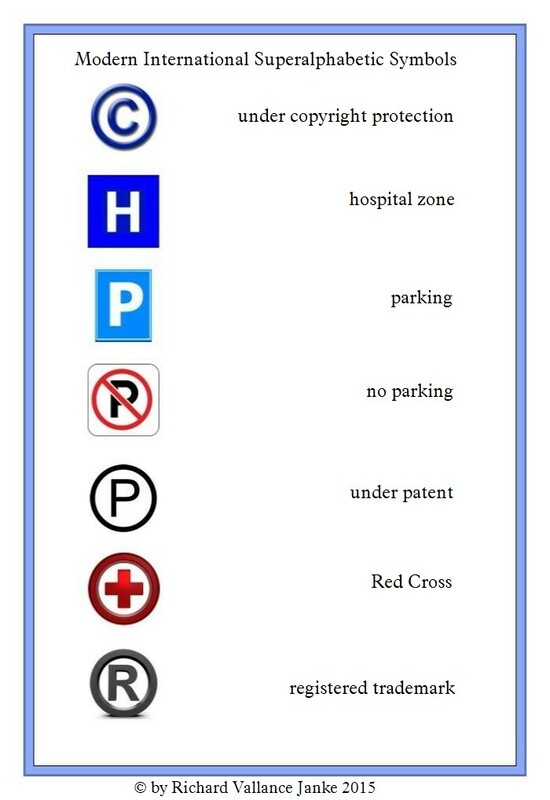 They even used ideograms as the equivalent of subject headings as they resurfaced in nineteenth century libaries, in the Dewey Decimal & Library of Congress systems. Witness just one tablet alone, namely, Pylos 641-1952 (Ventris), the very first tablet ever translated with complete success by none other than the great Michael Ventris himself, and you can see these “subject headings” for yourself, plastered all over that amazing tablet! Why did the scribes use so many ideograms for vessel types on this single tablet? The answer was obvious, at least to them... the ideograms for vessels were the signposts or indexing markers of this tablet which instantly allowed the scribes to identify the precise type of vessel described in the full text immediately preceding each one, even before they bothered reading the descriptive text. That this is a very clever indexing system goes without saying. And it re-appears over and over on so many tablets that it is without question one of the hallmarks of the Linear B syllabary. Finally, their numeric accounting system was the most efficient ever devised in the ancient world. Summarizing all of the streamlined characteristics of Linear B we have just enumerated, it becomes obvious that Linear B was, first and foremost, a carefully devised form of shorthand for Mycenaean Greek. Once again, the Mycenaean scribes anticipated a methodology for writing business transactions which would not re-appear as modern shorthand – you guessed it – until the nineteenth century AD. 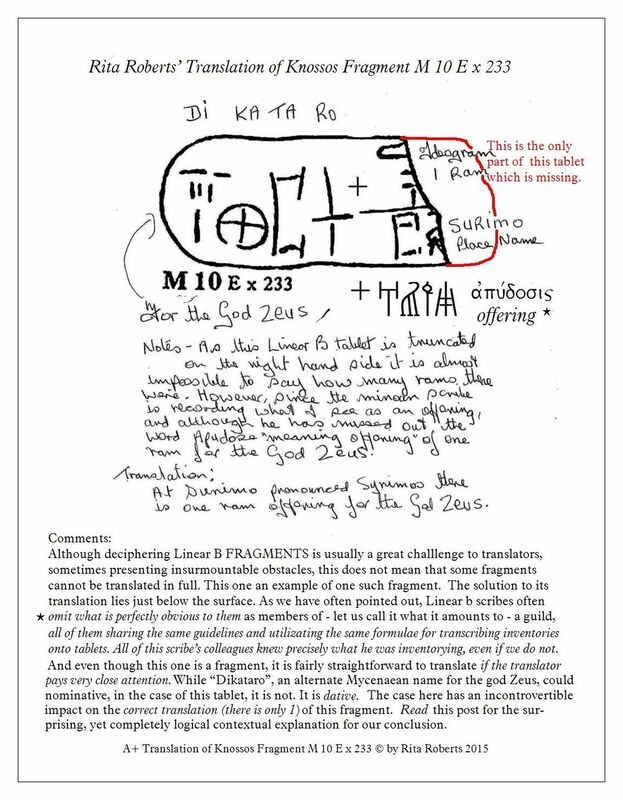 All of this adds up to one inescapable conclusion: Linear B was the world’s fist ever commercial shorthand, and until the nineteenth and twentieth centuries, there was nothing even remotely as efficient, logical and practical ever to be found throughout history until... the modern era. This is precisely why I am so in awe of Linear B, a script which was millennia ahead of its time. It is also why I refuse to characterize Linear B as being prehistoric. It is nothing of the sort. It is in a word, a proto-historic writing and accounting system, leading me to the inexorable conclusion that Minoan/Mycenaean society was in fact not prehistoric at all, but proto-historic. I am not the first linguist specializing in ancient linguistics to have asserted this claim, but I am the first to speak up as emphatically and unequivocally as this. This then has been a brief summary of the functions and the key rôle supersyllabograms play in the decipherment of Mycenaean Linear B. Surprise, surprise! 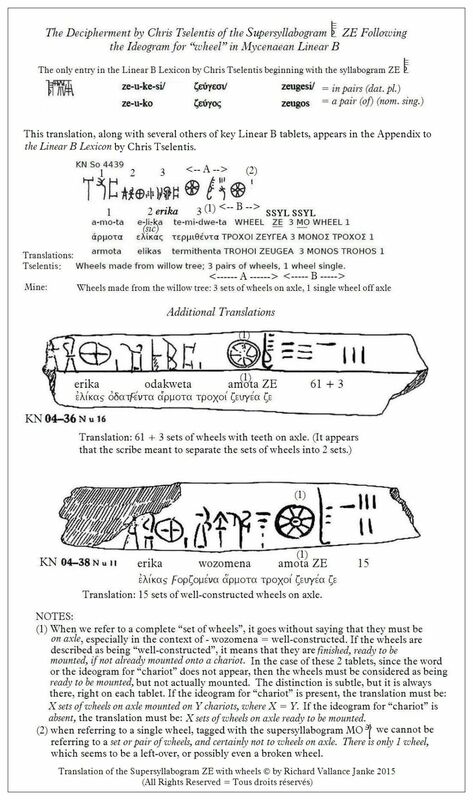 What rôle does Formulaic Language play in Linear B Tablets, and does it have anything to do with Homer’s archaic Greek? Surprise, surprise! What rôle does Formulaic Language play in Linear B Tablets, and does it have anything to do with Homer’s archaic  Greek? (a) that the Linear B scribes very frequently used what Rita and I call supersyllabograms, a term which describes a peculiar phenomenon common to only a subset of syllabograms which have defied decipherment for the past 63 years since 1952. We shall be deciphering almost all of the 31 supersyllabograms, a substantial subset of the full set of 61 syllabograms (over 50 %). Only a very few supersyllabograms still defy decipherment, at least for us, but someone in the near future may find the keys to even those ones. Enough of that for now. We will be publishing our complete peer-reviewed research paper later on this year. So folks will just have to wait. From the red outline to the right, you can see that I have filled in the rest of the missing section of this Linear B tablet. I am confident that the tablet in its entirely did in fact look almost exactly as you see here, because there is only 1 ideogram (for ram) only partially missing, while the word, SURI on the second line is clearly the Mycenaean place name, SURIMO, or in Greek, Syrimos. Since this tablet is clearly all about an offering TO the god Dikataro (dative!) or Zeus, and no one in their right mind would sacrifice more than one ram or animal to any of the gods, livestock being indispensable to their livelihood, it follows that one ram and one ram only was sacrificed to the god. Ergo, there cannot possibly be much more on the truncated right side of this fragment than the outline in red I have tacked on to its end. Does Formulaic Language in Mycenaean Linear B Tablets Have Anything to do with Formulaic Archaic Greek in Homer’s Iliad and Odyssey? Surprise, surprise. It does. And so does Arcado-Cypriot in its alphabet or in Linear C.
My Hypothesis runs as follows. If this premise does not hold water for some translators of Linear B, recall that Homer also heavily relied on formulaic phrases. He appears to have picked up that habit, not only from the Mycenaean Greek scribes who preceded him by 400-600 years, but also from the Arcado-Cypriot scribes, who wrote in the Linear C syllabary and in the Arcado-Cypriot Greek alphabet at the very same time as he was composing the Iliad – a fact that all too many historians and linguists completely overlook. Recall that Linear C had already evolved from the almost exclusively accounting and inventorial syllabary (Linear B ) to a literary one, with many of their tablets simultaneously composed in both Linear C and in alphabetic Arcado-Cypriot Greek. The lengthy legal document, the famous Idalion tablet, ca. 400 BCE, was one such tablet, written in both Linear C and alphabetic Greek. But Linear C had been in constant use from ca. 1100 BCE (long before Homer!) non-stop all the way through to ca. 400 BCE, when the Arcado-Cypriots finally abandoned it in favour of the Greek alphabet alone. My point is simply this: I for one cannot believe that Homer was not even remotely familiar with documents in the Arcado-Cypriot alphabet or possibly even in Linear C, because there were plenty of them around at the time he wrote the Iliad and the Odyssey (if he did). 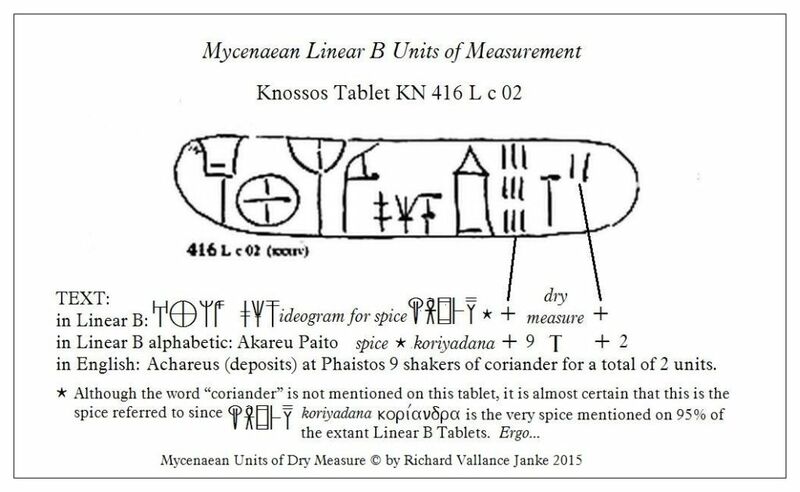 So even if he was not at all familiar with Mycenaean Linear B, he certainly must have known about, and may very well have read documents in Arcado-Cypriot. But that is not all. In spite of the fact that he almost certainly did not know Linear B, being familiar as he most likely was with the vocabulary and grammar of Arcado-Cypriot meant that he automatically had some inkling of Mycenaean Greek. Why so? 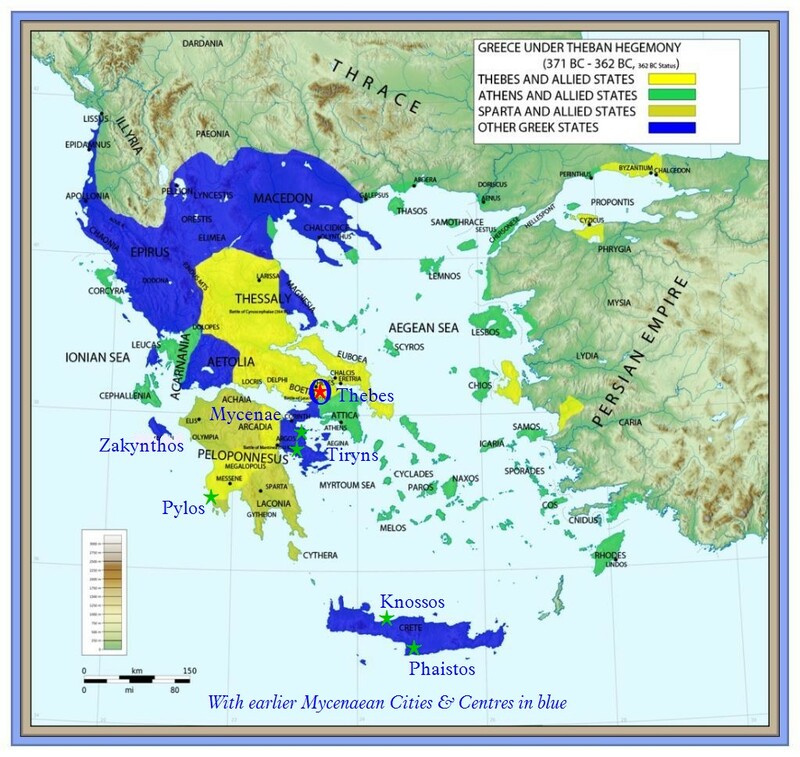 - simply because of all the ancient Greek dialects (archaic or not), no two were more closely related than Mycenaean and Arcado-Cypriot, not even Ionic and Attic Greek – not by a long shot. This alone implies that even if Homer consciously knew nothing about Mycenaean Greek, its vocabulary and grammar, unconsciously he did, because every time he borrowed formulaic language from Arcado-Cypriot, he was in effect borrowing almost exactly the same vocabulary and phrases from Mycenaean Greek. t = th, r = l & s = ss, hence tarasa = thalassa, down to the last letter. Anyway, for the time being, I rest my case. But with respect to the relationship between formulaic language in Mycenaean Linear B and Arcado-Cypriot, whether in Linear C or alphabetic on the one hand, and Homer’s use of formulaic language on the other, there is more to come on our blog this year – much more. 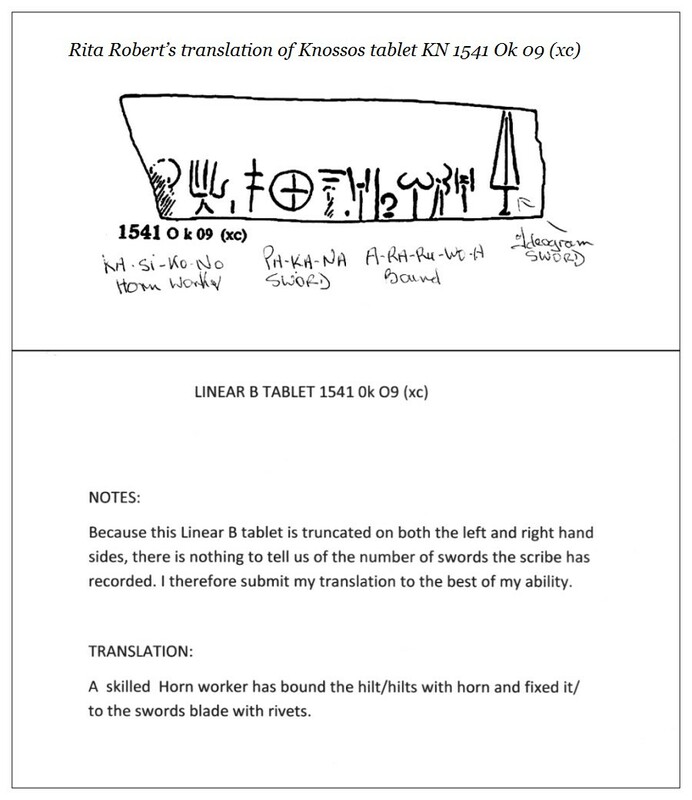 It is highly advisable for all of you who are experienced translators of either or both Mycenaean Linear B and Homeric Greek to read all of my translations in series of the entire Catalogue of Ships in Book II of the Iliad, wherein he uses the most archaic Greek in all of the Iliad. Otherwise, you may experience some difficulty following my thesis on formulaic language and the hypotheses upon which it is based. As for the rest of you folks, who are not translators, but who frequently read the posts on our blog, just enjoy and assimilate the essentials, and forget the rest, because all of the technical stuff I delve so deeply into doesn’t matter anyway unless you are a translator. Still, you may be asking, why delve into so much detail in the first place? Great question. It is all for the benefit of our fellow translators and decipherers, to whom we absolutely must address so many of the posts on our pointedly technical blog. Nevertheless, our blog is open to all to enjoy and read, as far as each of you wishes to take yourself. As I said just now, keep what you like and leave the rest. You will always learn at least something truly valuable to yourself. Otherwise, why would you be a regular visitor to our blog in the first place? 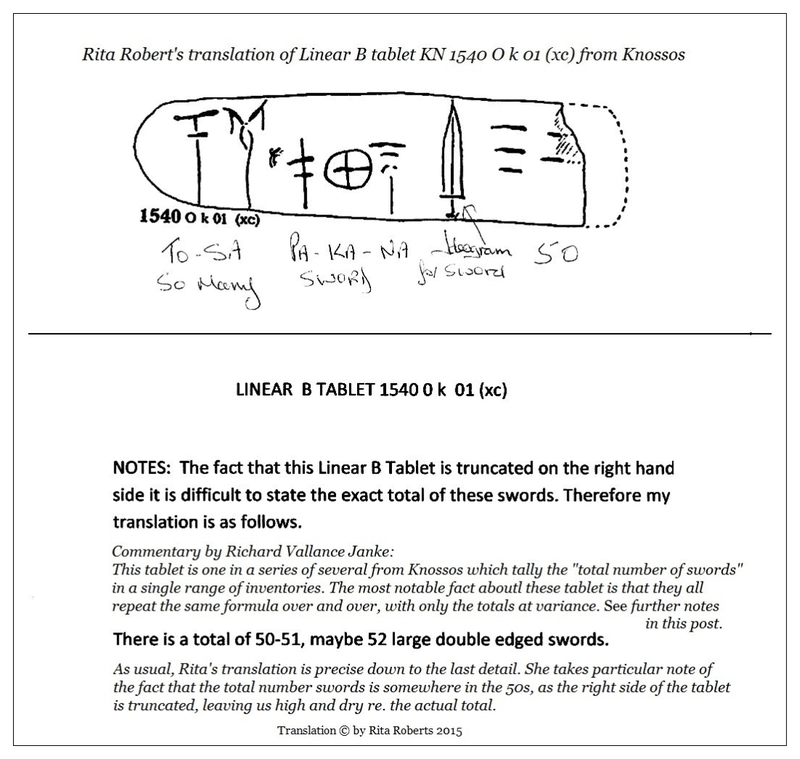 Now that Rita has been translating tablets from Linear B into English for well over a year, she has come to learn quite a few tricks of the trade, and is well aware of the numerous pitfalls that beset translators of Mycenaean Greek, who can and all too often do fail to “read” everything that the scribes meant to convey, leaving unsaid what they all knew perfectly well they actually were saying to one another, regardless of inventorial context. 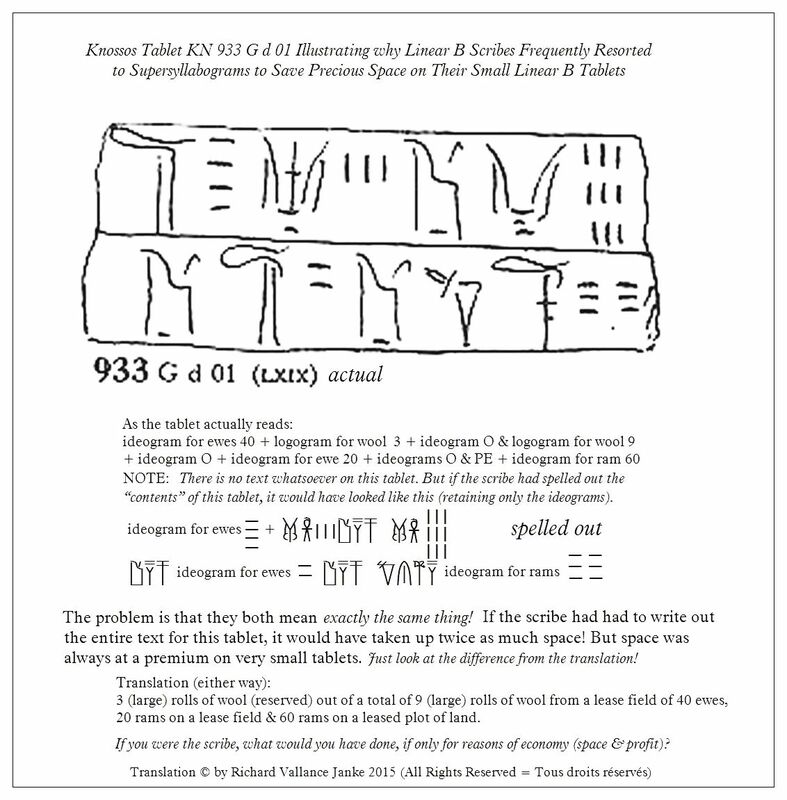 This phenomenon occurs over and over on the majority of Linear B tablets, and always for the same reason: the scribes were forced to save as much valuable space as they possibly could on a very small, cramped medium, the Linear B tablet. They quickly became extremely adept at finding clever little shortcuts around the problem of cramming as much essential – versus inessential - information as they could into the little space afforded them. She is fully aware that the Linear B scribe who wrote this text was actually saying much more than that. The scribe was able to telescope or abstract the full content of his message into just 2 Linear B words + 1 ideogram + the numeral 1. So what exactly was he saying? Today, we no longer know, nor can we. But rest assured that all his fellow scribes knew exactly what he was saying, because they all followed the same “script”, consisting of the same formulaic, usually partial, phrases; the same logograms and ideograms; and the same supersyllabograms repeated over and over, from Knossos to Phaistos to Pylos to Mycenae to Thebes, you name it, anywhere where Mycenaean Greek was written down in Linear B. 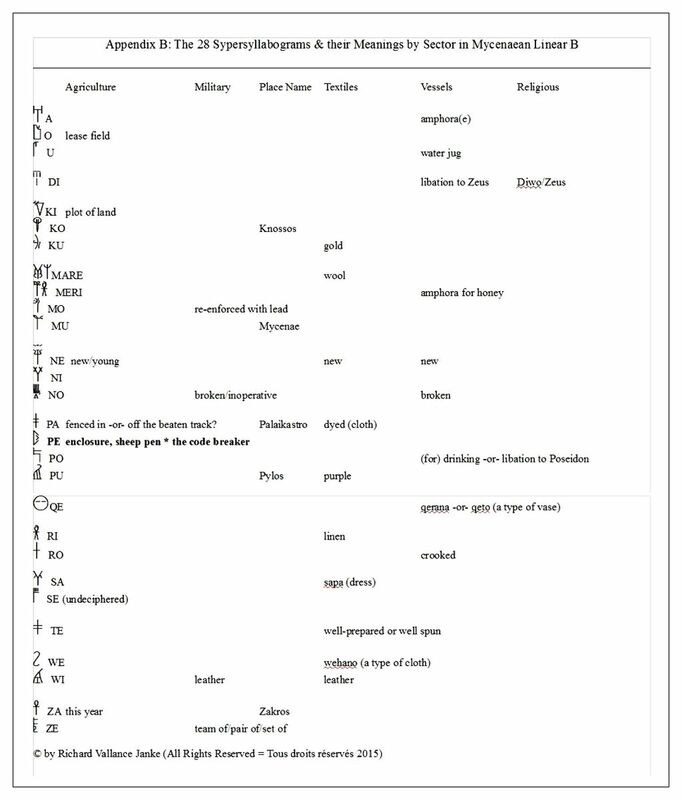 The Mycenaean Greek as composed in Linear B was by far the most uniform ancient Greek script, because it was an inventorial language, and nothing more, in other words, a finely telescoped subset of the Mycenaean dialect. No one has ever seen the Mycenaean dialect per se actually written out in full sentences, paragraphs and documents, because it never was. I repeat, Linear B is a small statistical inventorial subset of Mycenaean Greek. To view it any other way is tantamount to forcing it far beyond its clearly defined, restricted boundaries, and to twist it into something it was never meant to be, i.e. a dialectical script. OMITTED: any of these words: our, offering, gift, vessel, vial, olive oil & anyway, just who are “all the gods”! The scribes all knew. We don’t. Too bad. Tough. The reason for the insertion of the Mycenaean Linear B word, * APUDOSIS * (offering) is transparent enough. It was frequently used on Linear B tablets in contexts just such as this, and so, if omitted, it can still be supplied. Secondly, the oil used by the Greeks was almost always olive oil, which of course had to be contained in some type of vessel. There are well over 20 Linear B ideograms for vessels. But why mention the vessel when (as I am sure any scribe would have told you) it is obvious to any idiot that you put olive oil in a vessel. Omit what it obvious to “everyone” (us scribes) & save lots of space. Great! Ergo... one thing is pretty much certain. At least one of the translations above has to be almost spot on, regardless of word order, which does not amount to much more than a hill of beans in Mycenaean Greek anyway, given that as much is left unsaid as is spelled out. In our next post, we shall discuss in greater detail the profound implications this methodology of interpretation has on the decipherment and translation of practically all Linear B tablets right acrossthe board.